RANDOLPH — Madelia Griffith loves to bake and she has turned her passion into a business to help others who are less fortunate. A fourth grade student at Gail N. Chapman Elementary School in Randolph, Madelia recently started her own baking business, “Season’s Sweet Sensations,” for the purpose of helping people in the community. The young entrepreneur takes orders and makes a different themed cookie each month, then she donates a portion of the proceeds to a local charity. Whether the donation is big or small, Madelia gives it with a big generous heart. 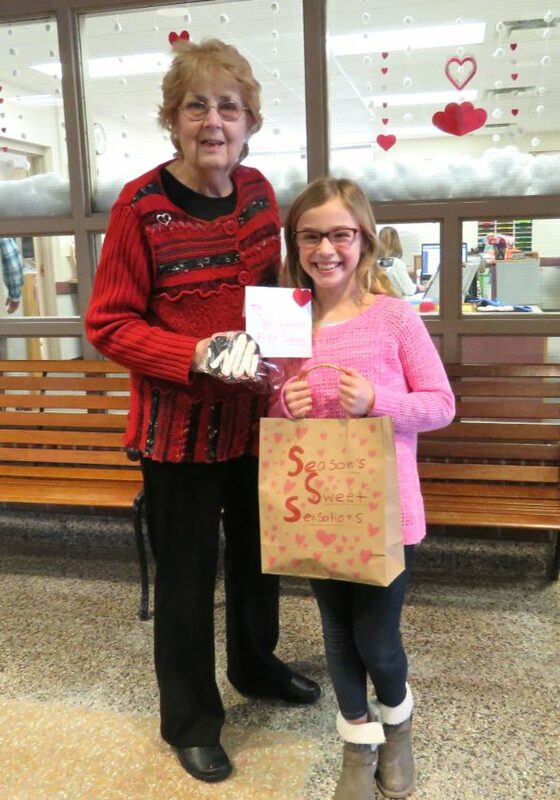 Her mother, JamieLynn Griffith, a second grade teacher at the school, said donating a portion of the proceeds to charity is her daughter’s focus, along with creating caring cards that include kind words to the recipient. Madelia started the year out by making almond snowflake cutouts and donating to the Randolph Community Cupboard, in January. This month, she is appropriately making dark chocolate heart cutouts beautifully decorated with a delicate zig-zag design. She bakes most of the cookies on her own but because these were more complex, her father, Rob Griffith, helped. He is the CA BOCES Technology Integration technician at Randolph Central School. On Feb. 13, she presented Ellen Beck, head librarian at the Randolph Free Library, with a donation. She said she chose the library for February because of the love on Valentine’s Day and her love of reading. Beck said she’s known Madelia since she was a little kid. She’s one of her special library patrons and she loves to see her come in. “I think she’s great and doing this for the library is about the best thing in the world,” she said. Madelia said she got some ideas on how to run her business from her parents and her brother, Mathurin, who is in the sixth grade. He also helped her select some of the charities. Her mother said Madelia didn’t have a business plan in writing or drawn up, but she presented the idea that she had been creatively thinking about and it seemed doable so, as a family, they encouraged her. Elementary Principal Jerry Mottern said Madelia is a very sweet girl who is mature, kind, bright and hard working. He’s very proud of her, and he likes that she found something she enjoys doing and is using that talent to further her cause. Madelia is planning to have a cookie theme of colorful rainbows and lucky wishes for March, and she plans to donate to the Western New York Make-A-Wish Foundation. She doesn’t notify the charity ahead of time; she makes a card with the donation inside and presents it to them as a surprise. Mostly friends, family and school staff order for now, but the community is invited to participate. Anyone who would like to help with her cause can come to the Gail N. Chapman Elementary School, 22 Main St., in Randolph, where they may order cookies in the faculty room and read Madelia’s flyer.